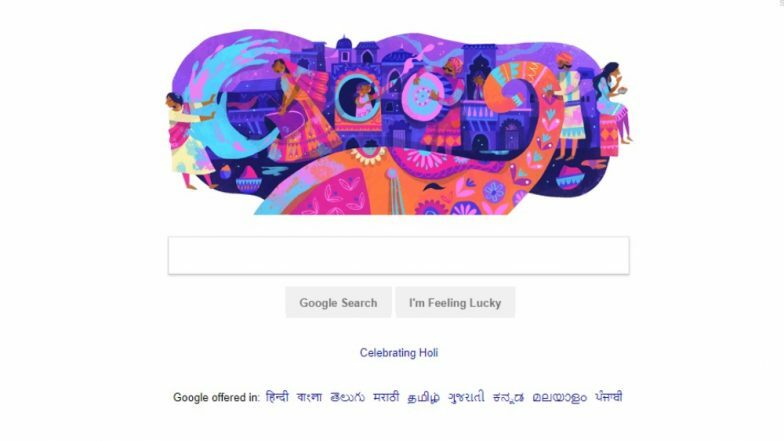 Holi – the festival of colours – would be celebrated across India and abroad on Thursday, and Google has celebrated it by dedicating a doodle for it. Google has come up with a doodle wishing all the Indians in India and abroad on the auspicious occasion of Holi. The latest Google doodle ushers in Spring with a display of colours with which people are celebrating the festival. Hours before the festival of Holi, and on the day of Holika Dahan, prominent UNESCO site of heritage – Gateway of India – was splashed with the colours of Holi to mark the festival. Due to the light show, the monument glittered and showcased the ‘Unity in Diversity’. It is to be known that Gateway of India is an arch monument built during the 20th century in Mumbai, India. Holi 2019: Why Is Holi Celebrated? Mythological Stories Behind the Festival of Colours. According to the Hindu religious customs, Holi is one of the majorly celebrated festivals across India. Holi 2019 will be marked with Holika Dahan on March 20, also known as Choti Holi. The following day is called the rangwali Holi which sees people immersing in colours and water as a part of the festivities. Some parts of North India, especially the state of Uttar Pradesh has enthusiastic celebrations of this festival of colours.